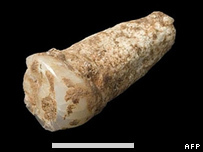 Jose Maria Bermudez de Castro, co-director of research at the Atapuerca site said the molar, discovered on Wednesday in the Atapuerca Sierra in the northern province of Burgos, could be as much as 1.2-million years old. “The tooth represents the oldest human fossil remain of western Europe. Now we finally have the anatomical evidence of the hominids that fabricated tools more than one million years ago,” the Atapuerca Foundation said in a statement. In 1994 at the nearby Gran Dolina site several Homo antecessor fossils were uncovered, suggesting human occupation of Europe around 800 000 years ago, whereas scientists had previously believed the continent had only been inhabited for around half a million years. The date of 1.2 million years fits within the time-frame of the Orce and Cueva Victoria finds in Murcia, and the only species of archaic human around at the time was Homo erectus, who was in fact the true pioneer of the Lower Palaeolithic. The ancient fossil site of Renzidong (Renzi Cave) in Anhui Province, eastern China, is yielding animal bones and possible stone tools showing that Homo erectus may have established itself here 2.25 million years ago, more than 400,000 years earlier than previously thought. Renzidong appears to be the oldest among a growing number of sites suggesting great antiquity for hominins (humans and close ancestors) in East Asia. The site, a large fissure, is also fueling a debate on the origins of our genus Homo, with some Chinese scientists proposing an evolution of H. erectus in China parallel to that already observed in Africa. about 50 stones and bones fractured to make flakes and scrapers. Early hominins apparently descended into the fissure to butcher the animals that fell in. The problem is that their technology in East Asia was simple; archaeologists frequently have trouble distinguishing real knapped tools from similar objects splintered by natural forces. Moreover, fissure infills never preserve the kind of evidence of habitation we know so well from contemporary sites in East Africa, such as at Tanzania’s Olduvai Gorge. But the 1999 campaign began to show something different. The skeletons of a mastodon and a tapir, both victims of falls, were found together in the dig’s lower levels. The mastodon bones lie piled along one wall, while the tapir remains seem to have been laid out for butchering; tools were found scattered about. Under this stratum there appears to be a level of Procynocephalus skeletons. This primate, like H. erectus, preferred open environments. Fossils of H. erectus and similar monkeys are often found together at Asian and East African sites. The Nihewan Basin in northern China is a major area of archaeological research in East Asia and a prime focus for the search for early hominids. It is located in Hebei Province, about 150 km northwest of the Zhoukoudian Locality 1 Homo erectus site near Beijing (fig. 1). The Nihewan is a large extinct lacustrine basin with extensive Pliocene and Pleistocene deposits containing hominid activity sites with associated fossil fauna and stone artifacts. These sites are indicative of the earliest hominid occupation in East Asia at 40° north latitude (Schick et al. 1991, Zhu et al. 2001, Wei 1991, Keates 2000, Shen and Chen 2003). The newly identified site of Goudi, in the eastern Nihewan Basin, where in situ lithic artifacts and fossil fauna have been found associated in Early Pleistocene sediments, has been dated paleomagnetically to about 1.66 million years (Zhu et al. 2004) and therefore represents the earliest hominid occupation in East Asia. As was pointed out to me by Robert Bednarik, in one of several emails he very kindly sent me in patient response to a few questions I had, a great deal of the relevant literature is not written in English, and and as such we in the West have very little idea of the general, let alone entire picture of early human dispersals in the Lower Palaeolithic. Moreover there is no clear evidence of exactly when and where Homo erectus appeared at the beginning of their 2 million year sojourn on this Earth, and neither was there one single pulse of Homo erectus leaving Africa to spread across the world. The site of Longgupo Cave was discovered in 1984 and excavated in 1985-1988 by the Institute of Vertebrate Paleontology and Paleoanthropology (Beijing) and the Chongqing National Museum (Sichuan Province). Important finds include very archaic hominid dental fragments, Gigantopithecus teeth and primitive stone tools. Paleomagnetic analysis and the presence of Ailuropoda microta (pygmy giant panda) suggest that the hominid- bearing levels dated to the earliest Pleistocene1. In 1992, joint Chinese-American-Canadian geochronological research corroborated the age using electron spin resonance (ESR) analysis. We report here that the hominid dentition and stone tools from Longgupo Cave are comparable in age and morphology with early representatives of the genus Homo (H. habilis and H. ergaster) and the Oldowan technology in East Africa. The Longgupo dentition is demonstrably more primitive than that seen in Asian Homo erectus. Longgupo’s diverse and well- preserved Plio-Pleistocene fauna of 116 species provides a sensitive contextual base for interpreting the early arrival of the genus Homo in Asia. Similarly many species of Neanderthalensis in Europe and Western Asia and the ancestors of Homo sapiens at the same time evolved in Africa, surprisingly a small male fossil hominid in South China very closely resembles Neanderthal species. I have proposed that this site might contain the entire sequence of the human occupation on the Indian subcontinent. In its lower strata it contains a layer of Oldowan pebble tools, which amazingly have received almost no attention so far. It must be borne in mind that the entire region between southern/eastern Africa and Levant in the west and Java and China in the east remains profoundly neglected, in terms of its hominid history. As is the case with China, India is virtually unknown to us from its Palaeolithic perspective, and it might be the case that it too has some archaeology awaiting discovery which will once again cause us to re-write entire episodes of the nature and abilities of our very distant and archaic ancestors. Many thanks to Robert Bednarik for forwarding me the link, and in the not too distant future, I’ll be taking a closer look at the EIP project in particular, and Plesitocene India in general.